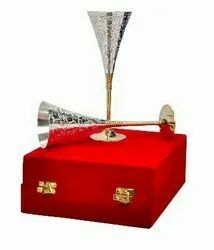 We are one of the reputed providing a wide range of Brass Giftware Products that are highly praised in the market. All these items are availble with us on affordable prices and in enchanting quality. This Silver Plated Brass Rose Flower Shaped Bowl 4.5" Diameter Made up of pure brass it is beautifully carved on the surface. Gift it or use it, it is sure to be admired by all. The gift piece is prepared by master artisans of Jaipur. The Mouth Freshener set could be used as a fruit bowl or to serve any other dessert during a guest visit or simply keep it in your drawing room or dining table for an alluring look. 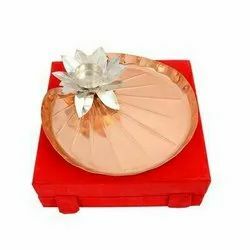 This Silver Plated Brass Bowl Lotus Flower Shaped 5" Diameter Made up of pure brass it is beautifully carved on the surface. Gift it or use it, it is sure to be admired by all. The gift piece is prepared by master artisans of Jaipur. The Bowl could be used as a fruit bowl or to serve any other dessert during a guest visit or simply keep it in your drawing room or dining table for an alluring look. 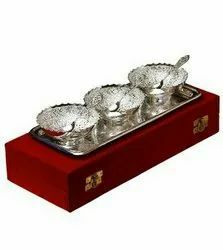 This Silver Plated Three Khand Platter 6"x6" Made up of pure brass it is beautifully carved on the surface. Gift it or use it, it is sure to be admired by all. The gift piece is prepared by master artisans of Jaipur. The Platter could be used as a Mouth Freshener a guest visit or simply keep it in your drawing room or dining table for an alluring look. 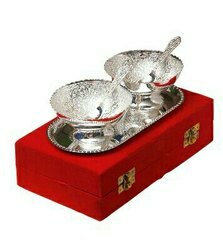 This Silver Plated Brass Bowl Set 5 Pcs. (Bowl 3.5" Diameter & Tray 8"x 4.5") Made up of pure brass it is beautifully carved on the surface. Gift it or use it, it is sure to be admired by all. The gift piece is prepared by master artisans of Jaipur. The Mouth Freshener set could be used as a fruit bowl or to serve any other dessert during a guest visit or simply keep it in your drawing room or dining table for an alluring look. 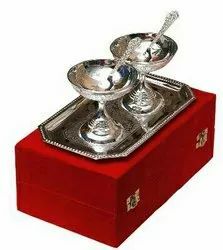 This Silver Plated Brass Bowl Set 7 Pcs. (Bowls 4" Diameter & Tray 13"x5.5") Made up of pure brass it is beautifully carved on the surface. Gift it or use it, it is sure to be admired by all. The gift piece is prepared by master artisans of Jaipur. The Bowl Set could be used as a fruit bowl or to serve any other dessert during a guest visit or simply keep it in your drawing room or dining table for an alluring look. 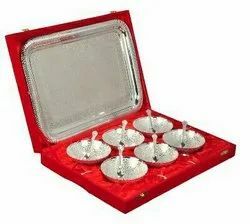 This Silver Plated Brass Traditional Bowl Set 7 Pcs. (Bowl 4" Diameter & Tray 13"x5.5") Made up of pure brass it is beautifully carved on the surface. Gift it or use it, it is sure to be admired by all. The gift piece is prepared by master artisans of Jaipur. The Mouth Freshener set could be used as a fruit bowl or to serve any other dessert during a guest visit or simply keep it in your drawing room or dining table for an alluring look. Size Bowls 4" Diameter & Tray 14"x10"
This Silver Plated Brass Bowl Set 13 Pcs. (Bowls 4" Diameter & Tray 14"x10") Made up of pure brass it is beautifully carved on the surface. Gift it or use it, it is sure to be admired by all. The gift piece is prepared by master artisans of Jaipur. The Bowl set could be used as a fruit bowl or to serve any other dessert during a guest visit or simply keep it in your drawing room or dining table for an alluring look. 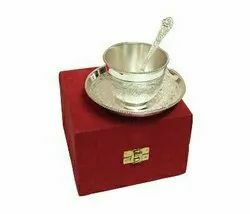 This Silver Plated Brass Cup & Saucer Set with Spoon (Cup 3" Diameter & Saucer 5" Diameter) Made up of pure brass it is beautifully carved on the surface. Gift it or use it, it is sure to be admired by all. The gift piece is prepared by master artisans of Jaipur. The Cup & Saucer Set could be used as a Tea Cup during a guest visit or simply keep it in your Kitchen or dining table for an alluring look. This Silver Plated Brass Coffee & Beer Mug Set 3.25" Diameter x4.5" Made up of pure brass it is beautifully carved on the surface. Gift it or use it, it is sure to be admired by all. The gift piece is prepared by master artisans of Jaipur. The Mug Set could be used as a Coffee Mug or to serve any other drink during a guest visit or simply keep it in your Kitchen or dining table for an alluring look. This Silver Plated Brass Beer Mug 3"x4.5" Made up of pure brass it is beautifully carved on the surface. Gift it or use it, it is sure to be admired by all. The gift piece is prepared by master artisans of Jaipur. The Mug set could be used as a Coffee or to serve any other drink during a guest visit or simply keep it in your Kitchen or dining table for an alluring look. 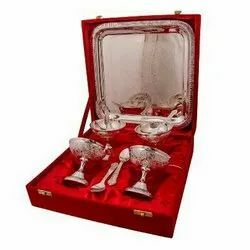 This Silver Plated Brass Glass Set 4 Pcs. (2.75" x4.5" Diameter) Made up of pure brass it is beautifully carved on the surface. Gift it or use it, it is sure to be admired by all. The gift piece is prepared by master artisans of Jaipur. The Glass Set simply keep it in your Kitchen or dining table for an alluring look. This Silver Plated Brass Wine Glass Set (9"x3.5" Diameter) Made up of pure brass it is beautifully carved on the surface. Gift it or use it, it is sure to be admired by all. The gift piece is prepared by master artisans of Jaipur. 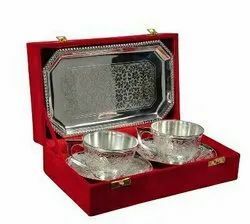 The Glass set could be used as a Wine Glass Set or to serve any other drink during a guest visit or simply keep it in your drawing room or dining table for an alluring look. This Silver & Gold Plated Brass Swan Shaped Candle Stand 2.5"x4.5" Made up of pure brass it is beautifully carved on the surface. Gift it or use it, it is sure to be admired by all. The gift piece is prepared by master artisans of Jaipur. Simply keep it in your Home for an alluring look. This Silver & Gold Plated Brass Rose Flower Shaped Brass Bowl 4.5" Diameter With Spoon Made up of pure brass it is beautifully carved on the surface. Gift it or use it, it is sure to be admired by all. The gift piece is prepared by master artisans of Jaipur. The Bowl set could be used as a fruit bowl or to serve any other dessert during a guest visit or simply keep it in your drawing room or dining table for an alluring look. This Gold & Silver Plated Brass Bowl 5" Diameter Made up of pure brass it is beautifully carved on the surface. Gift it or use it, it is sure to be admired by all. The gift piece is prepared by master artisans of Jaipur. The Bowl could be used as a fruit bowl or to serve any other dessert during a guest visit or simply keep it in your drawing room or dining table for an alluring look. 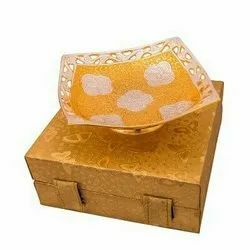 This Silver & Gold Plated Brass Bowl Square Shape 6.25"x6.25" Made up of pure brass it is beautifully carved on the surface. Gift it or use it, it is sure to be admired by all. The gift piece is prepared by master artisans of Jaipur. The Bowl could be used as a fruit bowl or to serve any other dessert during a guest visit or simply keep it in your drawing room or dining table for an alluring look. This Silver & Gold Plated Brass Sqaure Shape Bowl 6" Made up of pure brass it is beautifully carved on the surface. Gift it or use it, it is sure to be admired by all. The gift piece is prepared by master artisans of Jaipur. The Bowl could be used as a fruit bowl or to serve any other dessert during a guest visit or simply keep it in your drawing room or dining table for an alluring look. 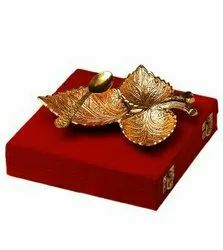 This Silver & Gold Plated Brass melon Leaf (7"x4.25") Made up of pure brass it is beautifully carved on the surface. Gift it or use it, it is sure to be admired by all. The gift piece is prepared by master artisans of Jaipur. The Mouth Freshener could be used as a fruit bowl or to serve any other dessert during a guest visit or simply keep it in your drawing room or dining table for an alluring look. This Silver & Gold Plated Brass Mouth Freshner Set 5 Pcs. (Bowl 3.25" Diameter & Tray 8"x4.25") Made up of pure brass it is beautifully carved on the surface. Gift it or use it, it is sure to be admired by all. The gift piece is prepared by master artisans of Jaipur. The Mouth Freshener set could be used as a fruit bowl or to serve any other dessert during a guest visit or simply keep it in your drawing room or dining table for an alluring look. 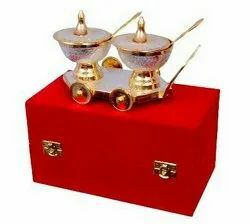 This Silver & Gold Plated Trolley Set 8"x4" & Bowl 3" Diameter Made up of pure brass it is beautifully carved on the surface. Gift it or use it, it is sure to be admired by all. The gift piece is prepared by master artisans of Jaipur. The Trolley set could be used as a Mouth Freshener or to serve any other dessert during a guest visit or simply keep it in your drawing room or dining table for an alluring look. This Silver & Gold Plated Brass Trolley Mouth Freshner Set (11"x4") Bowl 3" Diameter Made up of pure brass it is beautifully carved on the surface. Gift it or use it, it is sure to be admired by all. The gift piece is prepared by master artisans of Jaipur. 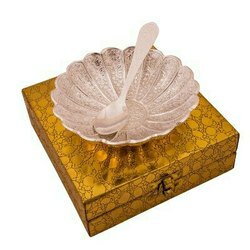 The Mouth Freshener set could be used as a Mouth Freshener bowl or to serve any other dessert during a guest visit or simply keep it in your drawing room or dining table for an alluring look. This Gold Plated Steel Pooja Thali 9" Diameter with Brass Bell Made up of Steel it is beautifully carved on the surface. Gift it or use it, it is sure to be admired by all. The gift piece is prepared by master artisans of Jaipur. Simply keep it in your Pooja Place for an alluring look. This Copper Pooja Thali 9" Diameter Made up of Copper it is beautifully carved on the surface. Gift it or use it, it is sure to be admired by all. The gift piece is prepared by master artisans of Jaipur. Simply keep it in your Pooja Place for an alluring look. 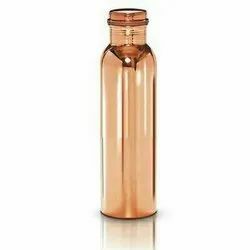 This Pure Copper Bacteria Killing Hygienic Water Bottle 1 Litre Made up of pure brass. Gift it or use it, it is sure to be admired by all. 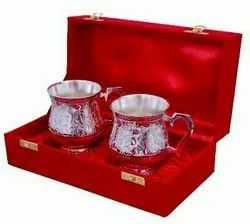 This Silver Plated Cup & Saucer Set 5 Pcs. (Cup 3" Diameter, Saucer 5" Diameter & Tray 9.5"x5.5") Made up of pure brass it is beautifully carved on the surface. Gift it or use it, it is sure to be admired by all. The gift piece is prepared by master artisans of Jaipur. The Cup & Saucer Set could be used as a Tea Cup during a guest visit or simply keep it in your Kitchen or dining table for an alluring look. This Silver Plated Brass Ice Cream Bowl Set 9 Pcs. (3.5"x3.5" & Tray 9"x9") Made up of pure brass it is beautifully carved on the surface. Gift it or use it, it is sure to be admired by all. The gift piece is prepared by master artisans of Jaipur. The Bowl set could be used as a Ice Cream bowl or to serve any other dessert during a guest visit or simply keep it in your Kitchen or dining table for an alluring look. 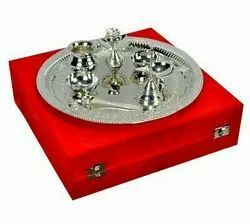 This Silver Plated Steel Pooja Thali 9" Diameter with Brass Bell is Made up of Steel it is beautifully carved on the surface. Gift it or use it, it is sure to be admired by all. The gift piece is prepared by master artisans of Jaipur. Simply keep it in your Pooja Place for an alluring look. 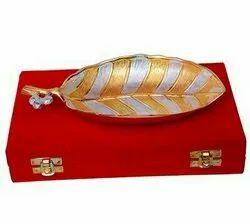 This Gold Plated Grape Three Leaf Platter 6"x6" Made up of pure brass it is beautifully carved on the surface. Gift it or use it, it is sure to be admired by all. The gift piece is prepared by master artisans of Jaipur. The Platter could be used as a Mouth Freshener or to serve any other dessert during a guest visit or simply keep it in your drawing room or dining table for an alluring look. 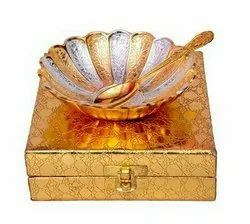 This Silver & Gold Plated Brass Bowl Set 5 Pcs. (Bowls 4" Diameter & Tray 8"x4.25") Made up of pure brass it is beautifully carved on the surface. Gift it or use it, it is sure to be admired by all. The gift piece is prepared by master artisans of Jaipur. The Bowl Set could be used as a fruit bowl or to serve any other dessert during a guest visit or simply keep it in your drawing room or dining table for an alluring look. 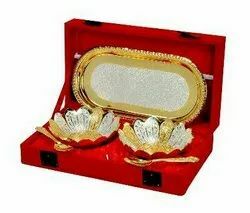 This Silver & Gold Plated Bowl Set 9 Pcs. (Bowls 4" Diameter & Tray 10"x10") Made up of pure brass it is beautifully carved on the surface. 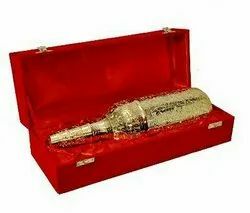 Gift it or use it, it is sure to be admired by all. The gift piece is prepared by master artisans of Jaipur. The Bowl set could be used as a fruit bowl or to serve any other dessert during a guest visit or simply keep it in your drawing room or dining table for an alluring look. 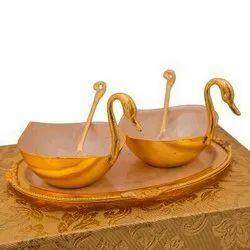 This Silver & Gold Plated Brass Duck Shaped Bowl Set 5 Pcs. (Bowl 3.5" diameter & Tray 8.75"x6.75") Made up of pure brass it is beautifully carved on the surface. Gift it or use it, it is sure to be admired by all. The gift piece is prepared by master artisans of Jaipur. The Bowl Set could be used as a fruit bowl or to serve any other dessert during a guest visit or simply keep it in your drawing room or dining table for an alluring look. 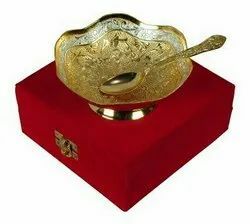 This Silver & Gold Plated Ice Cream Bowl Set 8 Pcs. (Bowl 3.5"x3.5" Diameter) Made up of pure brass it is beautifully carved on the surface. Gift it or use it, it is sure to be admired by all. The gift piece is prepared by master artisans of Jaipur. The Ice Cream Bowl Set could be used as a Ice Cream bowl or to serve any other dessert during a guest visit or simply keep it in your drawing room or dining table for an alluring look. This Silver & Gold Plated Brass Ice Cream Bowl Set 9 Pcs. (Bowl 3.5" Diameter & Tray 8"x8") Made up of pure brass it is beautifully carved on the surface. Gift it or use it, it is sure to be admired by all. The gift piece is prepared by master artisans of Jaipur. The Ice Cream Bowl set could be used as a Ice Cream Bowl or to serve any other dessert during a guest visit or simply keep it in your drawing room or dining table for an alluring look. 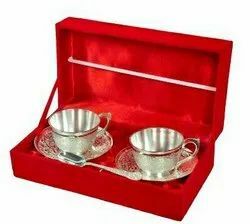 This Silver Plated Cup & Saucer Set 4 Pcs. (Cup 3" Diameter & Saucer 5" Diameter)Made up of pure brass it is beautifully carved on the surface. Gift it or use it, it is sure to be admired by all. The gift piece is prepared by master artisans of Jaipur. The Cup & Saucer Set could be used to serve Tea during a guest visit or simply keep it in your drawing room or dining table for an alluring look. 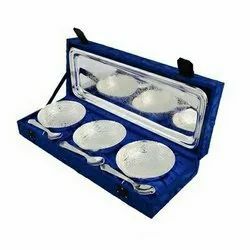 This Silver Plated Ice Cream Bowls Set 5 Pcs. (Bowls 3.5" Diameter & Tray 9.5"x5.5") Made up of pure brass it is beautifully carved on the surface. Gift it or use it, it is sure to be admired by all. The gift piece is prepared by master artisans of Jaipur. 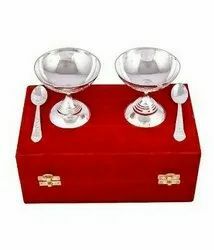 The Ice Cream Bowls Set could be used as a Ice Cream Bowls or to serve any other dessert during a guest visit or simply keep it in your drawing room or dining table for an alluring look. 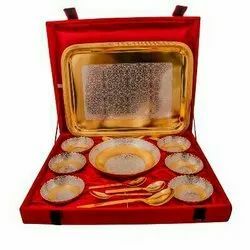 This Silver & Gold Plated Brass Pudding Set 15 Pcs. (Serving Bowl 7.5" Diameter, Bowl 4" Diameter & Tray 15.5"x12") Made up of pure brass it is beautifully carved on the surface. Gift it or use it, it is sure to be admired by all. The gift piece is prepared by master artisans of Jaipur. The Bowl set could be used as a fruit bowl or to serve any other dessert during a guest visit or simply keep it in your drawing room or dining table for an alluring look. 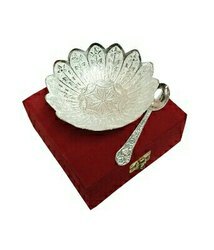 This Silver Plated Brass Ice Cream Bowl Set 4 Pcs. (Bowl 3.5"x3.5" Diameter) Made up of pure brass it is beautifully carved on the surface. Gift it or use it, it is sure to be admired by all. The gift piece is prepared by master artisans of Jaipur. The Ice Cream Bowl Set could be used as a Ice Cream Bowl or to serve any other dessert during a guest visit or simply keep it in your drawing room or dining table for an alluring look. 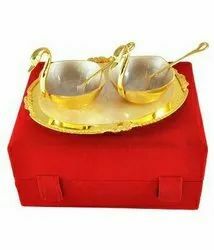 This Silver & Gold Plated Brass Duck Shaped Bowl Set 5 Pcs. (Bowl 3.5" diameter & Tray 8.75"x6.75") Made up of pure brass it is beautifully carved on the surface. Gift it or use it, it is sure to be admired by all. The gift piece is prepared by master artisans of Jaipur. The Mouth Freshener set could be used as a fruit bowl or to serve any other dessert during a guest visit or simply keep it in your drawing room or dining table for an alluring look. 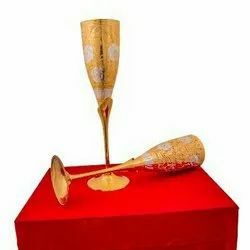 This Silver & Gold Plated Brass Wine Glass Set (9"x2.5") Made up of pure brass it is beautifully carved on the surface. Gift it or use it, it is sure to be admired by all. The gift piece is prepared by master artisans of Jaipur. Simply keep it in your drawing room or dining table for an alluring look. This Wine Bottle Holder 13"x3" diameter Made up of pure brass it is beautifully carved on the surface. Gift it or use it, it is sure to be admired by all. The gift piece is prepared by master artisans of Jaipur. Simply keep it in your drawing room or dining table for an alluring look.